The first nacho quest of 2018 kicks off on Quinpool Road, the final neighbourhood to be conquered by the Halifax (Peninsula) Nacho Quest! 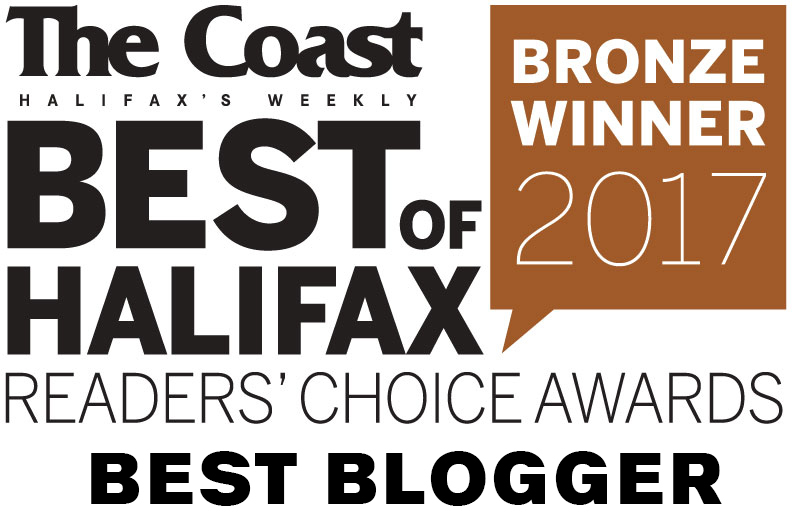 Today’s questers were: Denton, Halifax ReTales, Laurie Burns, Machzy and Halifax Wingman. 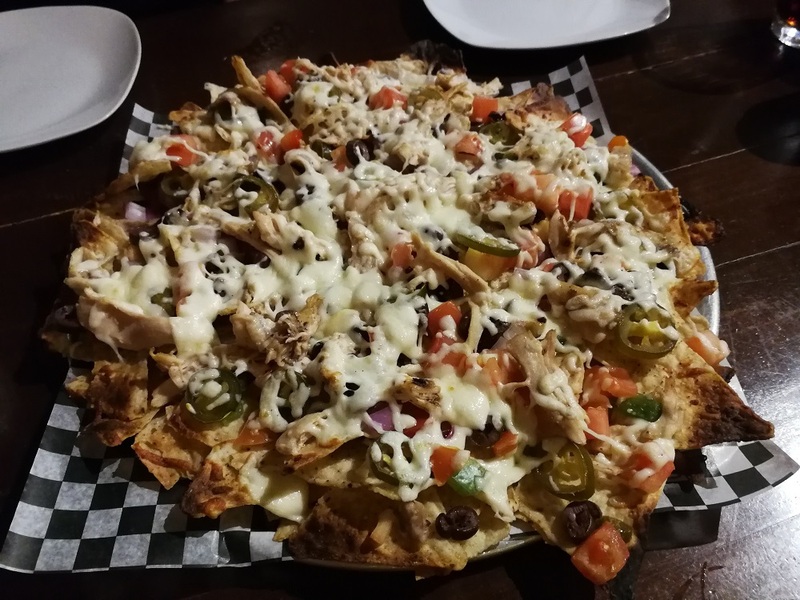 Our mission: to find the best nachos on Quinpool Road (and surrounding areas). 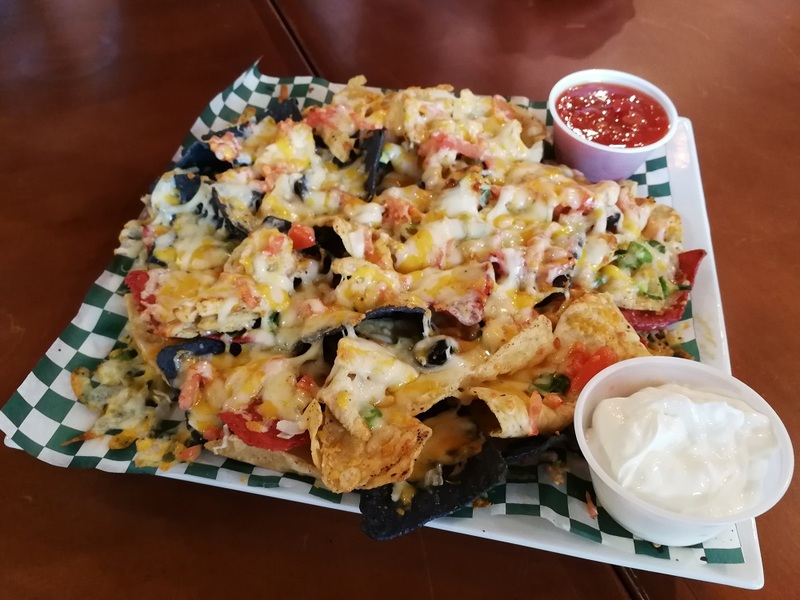 ***Update: Since publishing this post, a couple readers have informed me that I missed two restaurants on Quinpool that serve nachos – Gasp! Bad blogger! So in true Eat This Town fashion, I will be thorough. 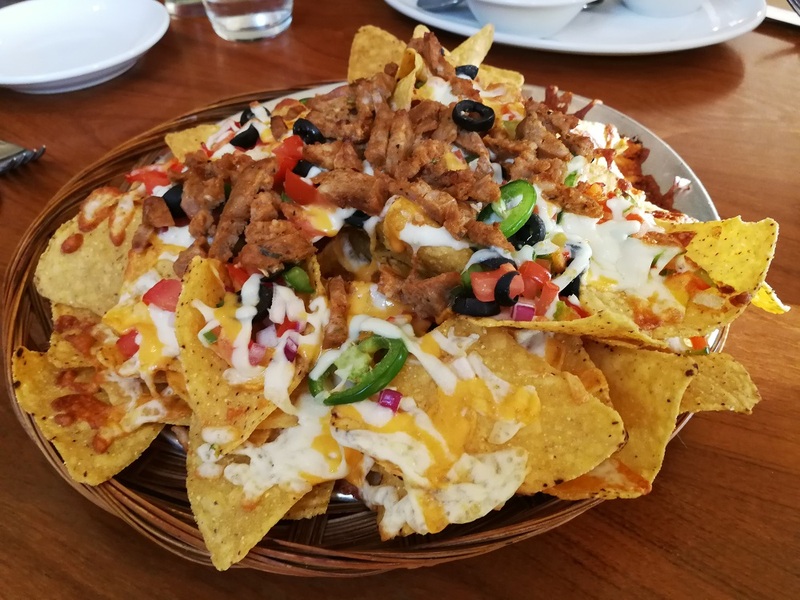 I rounded up an emergency nacho team last weekend and we evaluated Seasons by Atlantica (hotel) and Roll The Dice (board game café). These reviews have been appended to this post (scroll down). 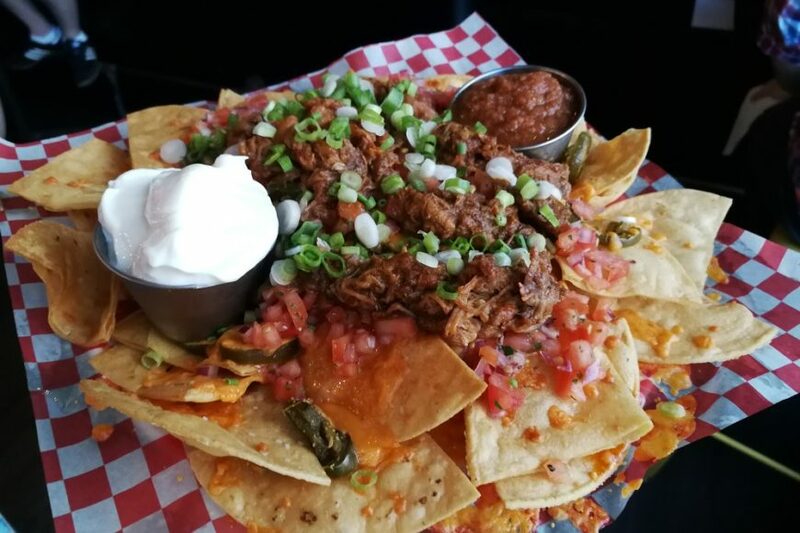 We decided to get pulled pork on our nachos, which is always risky. Some restaurants toss their pulled pork in a sweet barbecue sauce that overpowers the flavour profile. It is often dry and stringy or wet and mushy. But this pulled pork was de-licious! El Chino knows what’s up! It was moist and tender, with a nice warm spice blend. 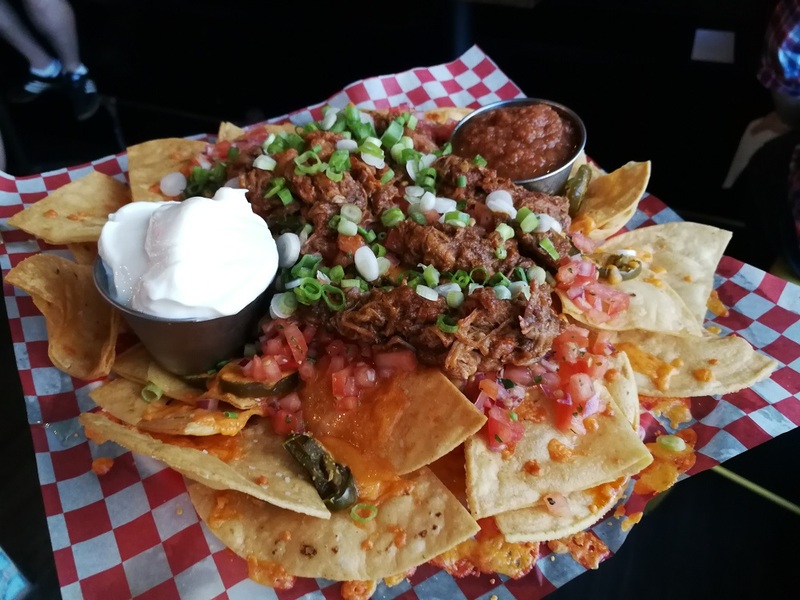 “The pulled pork was well suited to the nachos,” wrote Denton, “the spice didn’t overpower any of the other flavours, and it was easy to distribute across the plate.” The pulled pork would have stolen the show, had the other components been any less than stellar. The chips were house-made and perfect. Wingman would have liked a sprinkling of spice, but conceded that these are probably the best chips of the quest so far. The cheese was 100% real cheddar. Opinions were split about the merits of a blend vs. pure cheddar; some thought it was flavourless and gritty, while others respected the quality. Most people felt that there was adequate layering. Pico de gallo was lovely as a topping; the marinated and tiny diced vegetables made their way onto every bite with full flavour effect. The sour cream was thick and creamy, and the salsa was phenomenal! This was probably the best salsa we’ve had on the quest so far! It was thin and full flavoured, with a hint of cumin. Biggest Strength: Well, if I have to narrow it down… EVERYTHING. Okay, okay… chips, dips, and toppings are the real winners here. Biggest Weakness: The cheddar cheese might benefit from a mozzarella/jack injection. We decided on chorizo for our protein, despite the fact that our server was unfamiliar with the different types of chorizo and we weren’t really sure what we were getting. It turns out The Armview has a chorizo patty they use on their Dagwood Sandwich, and this was the same chorizo, chopped. Some questers loved the chorizo, while others felt it didn’t impart enough flavour/spice. I would have loved a spicy, crumbled chorizo but I still appreciate the novelty offered. We all felt that there wasn’t enough to go around, though. The chips were basic yellow triangles, and they were covered in a cheese blend. Most people thought the cheese coverage was adequate, but Wingman felt the cheese was “mostly just burnt on the chips”. The toppings ranged from fresh jalapenos and tomatoes to canned black olives. The quality was pretty good, but a few people noted that the toppings were sparse. The guacamole was full of chunks and bursting with lime flavour. That was definitely a highlight! The salsa on the other hand was strangely sweet. It was a chunky, house-made, fresh salsa, but “…more salad than salsa”, according to Denton. The Armview incorporated some premium elements, but the overall package was somehow less than the sum of its parts. We found these nachos pretty bland, and the sweet salsa did nothing to help. The real kicker was the price: $20 for these?! Really? Suddenly, El Chino’s prices are looking like a steal! There were oohs and aahs from the crowd as this large, action-packed platter was presented to us. However, our enthusiasm waned as we realized the many faults that lay before us. I’ll start with the positives: the toppings were pretty good! Real chicken mingled with kalamata olives and spicy-hot pickled jalapenos. Less positive: Rather than salsa and sour cream, these nachos came with Bramoso’s “signature queso”. I’m fine with breaking from tradition, but not the tradition in which words mean things. “Queso” means cheese. In this context, I would expect a cheese sauce. You know, like the stuff you get at the movie theatre. This “queso” looked and tasted like pasta sauce, with nary a hint of cheese. It was weird. But the worst thing about these nachos was that the edges were burnt, while the cheese covering was miraculously lukewarm. To add insult to injury, there was absolutely no layering. There were lots of bare and broken chips underneath the cheese canopy. 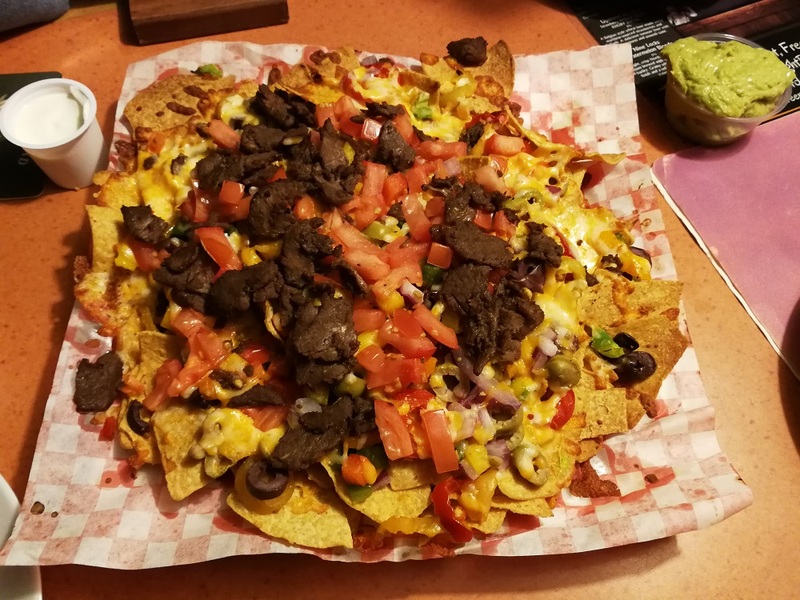 We examined Freeman’s nachos previously on the Argyle Street Nacho Quest, and those look quite different than what we had today! I also don’t remember Philly beef being an option last time, so we veered whimsically towards that. Denton felt that the Philly beef didn’t exactly jive with the flavour profile. Machzy thought the salsa was “awful”. The veggies weren’t the freshest, the cheese wasn’t plentiful, and the sour cream came in Nielsen tubs. But we are victims of comfort, and appreciated the familiar mediocrity. I found myself continuing to nibble on the barren landscape of golden salty chips. “All things considered, these were perfectly adequate nachos for a night of drinking…” conceded Denton, (who hadn’t been drinking), while others echoed this sentiment in a written chorus of: “good bar nachos”. This is an example of a dish that is more than the sum of its parts. Perhaps it was the dive bar aesthetic and plenitude of beer? Perhaps it was the combination of both black AND green olives?! Or …. perhaps it is just comfort food, plain and simple. The following plates of nachos were consumed on a later date by a different group of questers. Joining me were: Cailin O’Neil, Halifax ReTales, LA, and Curtis. I realize this isn’t an ideal situation, as I would like to have the same team and the same day to judge all of the nachos. But I’m confident with my findings, and it will all come together when I eventually publish the Top 10 List. When this plate of nachos was plopped down on our little lounge table, I realized what a mistake I had made forgetting about Seasons. These looked just about perfect! The first bite confirmed the quality of the full flavoured cheese. Real cheese. The chips were crispy and salty and worked really well with the cheese. The toppings were diced fine, which lent to full distribution. They weren’t of the utmost quality, but they worked. Beef is included in the price, and was delicious and well distributed. As we continued eating, we noticed that there was perfect layering! That full flavoured, melty golden cheese was in every nook and cranny! It was the glue that held this masterpiece together. The sour cream was thick and creamy, while the salsa and guac were just basic. However we did appreciate the generous allotments. I was so sad when these were gone…. “I almost fell asleep looking at them,” wrote Curtis of his first impression. It was going to be hard to “wow” us after our feast at Seasons, and these looked pretty basic. They were definitely cheesy, but the cheese blend wasn’t particularly flavourful. The tri-coloured chips were also completely void of flavour. Cailin wanted to give a score of -1 for the chips (an unprecedented move!). Despite the bland cheese and chips, LA insisted that all she could taste was “cheese and a bit of chips”, which speaks to the flavour imparted by the toppings. The basic salsa and sour cream did nothing to assist. The chicken was at the high end of the fast food chicken scale, but there wasn’t nearly enough of it. The layering was great, which contributed to the cheese factor. If I can say anything about these nachos, it’s that they were adequately cheesy. In general, we felt the ingredients were pretty cheap and didn’t warrant an $18 price tag. If they were in the $12 range, they’d make a fine treat for a board game session. Biggest Weakness: Lack of flavour. 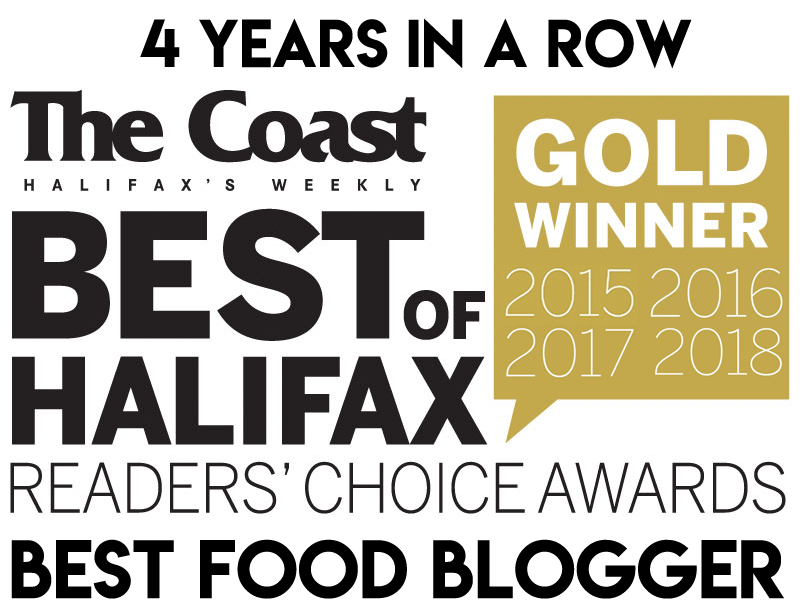 So what are the best nachos on Quinpool? Drum roll please! El Chino originally took first place in every category (besides guac, as they don’t offer it) and even 1st place for Value despite some qualms about the price. There really wasn’t much competition. These are the kind of nachos that elicit closed eyes, “Mmmmm”s and “Yassssss”s. Seasons was mistakenly passed over on the original quest, but was highly praised by those who were able to attend the second quest. El Chino has the better toppings, chips and salsa, whereas Seasons has the better cheese factor. The scores are too close (and my data too inconsistent) to declare a winner. But you can expect to see more of these nachos in the future! 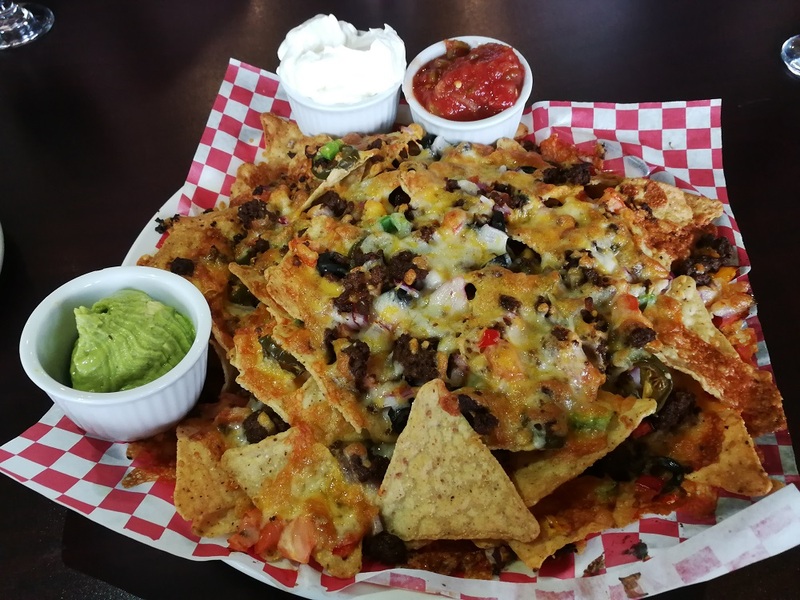 The Armview is a decent enough nacho if you live in the area, but the price is seriously wack. Freeman’s is nothing special whatsoever, but a perfectly serviceable bar nacho. Roll The Dice is a bit too pricey considering the quality of ingredients and flavours imparted, but it’s a good cheesy bar snack if you omit the chicken. Bramoso, meanwhile, has some issues to work out. The next quest will be to tie up all our loose ends: new restaurants, re-dos, and failed missions. I want to be thorough, so we are also pass/failing a bunch of restaurants we are uncertain about. Eventually I will have a tried-and-true Top 10 list for the peninsula! Follow me by e-mail to keep up-to-date and never miss a post! You should try the nachos on the $9 lunch menu at Season’s in the Altantica Hotel! They are awesome, and you can add Guac for only $1. They come topped with lots of veggies and spiced beef. Great Value for lunch! I’m such a bad blogger! I will be returning to Quinpool to pick up the pieces. Thanks for letting me know I missed something.